I recently ran a workshop with my dyslexia group to priorities the work the group does for the coming year. The key issue people wanted to address was how to manage distractions in an open plan office. A year ago I blogged about bringing focus to the scatty mind but I want to dig deeper. A lot of dyslexics struggle to maintain focus. Some people assume dyslexics have a problem paying attention. It is actually the opposite. I am trying to pay attention to my work, to the conversation three desks down, what I am going to have for tea, and when I will have to stop this task to get to my next meeting. My attention is everywhere. It’s focusing that attention productively that can be the challenge. Like it or not open plan offices are here to stay. There is plenty of research that shows they have a negative impact on productivity. However, cost of office space is easier to measure than the productivity of knowledge workers. There are two huge issues for different thinkers in an open plan office: noise and visual distractions. These challenges are compounded by the fact that once a dyslexic is distracted they can find it harder to resume the interrupted task due to working memory limitations. Open plan offices tend to be noisy places. 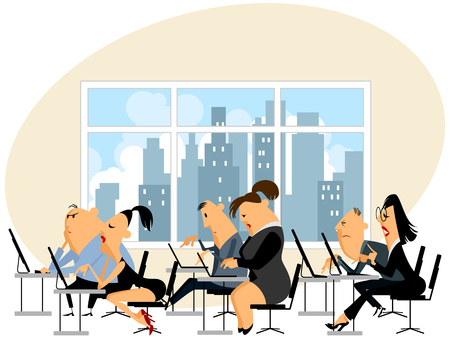 In a small office, a rhythm tends to develop where there are noisy spells (such as in the morning when everyone arrives, or mid-morning when everyone makes a brew) and quieter times. In an open plan office with multiple teams these rhythms are not synchronised so there is always a higher level of background noise. Noise cancelling headphones work by filtering out the noise. I love my noise-cancelling headphones. I find I can only wear them for an hour or so at a time so I try and determine when this will have the biggest benefit. One downside with noise cancelling headphones is that they can make some conversations clearer. The general noise level is reduced meaning the person talking on the phone at the other end of the office really stands out. That is where music comes in. Music can be used to block out noise on its own or in concert with noise cancelling headphones. I like to use music with the noise cancelling headphones as I can then listen at a lower volume. Choice of music is important when using it as a tool to combat distractions. Everyone is different with their preferences. I like to use a familiar album on repeat so my brain tunes it out. Some people go for classical music or acoustic music. There are special apps that have playlists of ambient noise and synthetic music especially to help with focus but I have not tried these. Avoid the radio as the presenters talking will distract. Some workplaces are more accepting of headphones than others. In some areas, they are seen as a sign of wanting to focus. In others, they are interpreted as a passive-aggressive rebellion against noisy colleagues. Some people consider wearing headphones in work as antisocial. If you can be open about your neurodiversity (or just your struggles with focus) have a conversation with your colleagues and your boss about why you are wearing them. You are likely to find that most people would like a quieter office and it might even prompt a conversation on how to make the office a more productive environment. If you have read bringing focus to the scatty mind you might already have your phone on silent at times when you need to concentrate. There are also other tips that be employed to limit phone distractions. I find that whenever a phone rings I look at my phone to see if it is mine ringing. In this split second my focus can be shattered and I then need to re-immerse myself in the job at hand. Changing my ringtone to something distinctive can reduce the likelihood of this happening. Just because my phone rings it does not mean I have to answer it. Different ring tones for internal and external calls can be a useful customisation to aid with this decision. With caller ID it is also possible to determine if it is a call that must be dealt with right now to processed later. This can stop a minor interruption becoming a full-blown distraction. When a phone rings and rings it can overcome my best efforts to stay on task. This can be reduced, if the phone system supports it, by setting handsets to only ring 1 or 2 times before going silent. Chances are if no one has picked up by the 2nd ring it will end up going to voicemail anyway. There are many other sources of noise in open plan offices. Some of these there is little that can be done to address them: things like noisy air conditioning. With a bit of creative thinking, some noises can be minimised. If colleagues have a big batch of printing to do then establishing a norm of setting this off just before lunch can reduce the impact of the noise. Replacing a noisy kettle with a hot water dispenser might need the buy-in from facilities management but it can reduce noise and reduce the time spent waiting for the kettle to boil. It also scores on the health and safety front as there is less chance of knocking this over compared to a kettle of boiling water. If a nice water dispenser is out of reach the simple act of offering to make everyone a brew can help to manage distractions. Often this will result in a little natter while the drinks are started then everyone naturally returns focus to work creating a welcome quiet spell. Turning off computer noises can also help reduce the background noise. A beep from the computer every time an email comes in not only distracts that user but also everyone else that can hear it. If there is a need to listen to audio use headphones as this is less distracting to others than playing through the computer speakers. Smaller offices and even screens, partitions and cubicles put a horizon on visual disturbances. In an open plan office, there can be long clear sight lines which invite visual disturbances. It is likely that you’ll have limited sway over the physical layout of the office. The strategic selection of a desk can go a long way to minimise distractions if you can convince the people who control desk allocation. The ideal desk for someone easily distracted is facing away from any thoroughfares (like the route to the printer/tea point/ printer). As nice as a desk with a window view is the outside has myriad distractions so avoid a window desk. The best desk will be no good if your self-sabotage. A million post-it notes scattered around your desk, a rolling news window, and the folders from 4 different projects all add up to engage your conscious and subconscious mind. Just have one your desk the things needed to do the task at hand. A possible exception to this is the addition of a notepad or journal to capture any distractions so you can return to the task without fear of forgetting the thought that nearly distracted you. Using all of the above techniques might not be enough to manage distractions in your open-plan office. So here are some tips that do not fit into the simple noise/visual categories. Using a free/busy indicator or desk traffic lights can help to indicate to colleagues that you are trying to focus. I have never really got on with these but know people who swear by them. If you need to be able to guarantee you will not be interrupted try working at different times. Friday evening can be a great time to work. Many people clock off early and very few stay late. Often offices are nice and quiet at this time enabling quality work to be done. If your office does not offer sufficient flexibility about when you work, or if you other commitments do not allow for this then consider changing where you work. I find if I sit with a different team I am less likely to be distracted. People are less likely to interrupt me. For some odd reason, I find it easier to avoid listening to the office conversations if it is not my team taking. Working at home is a natural extension of working away from your normal desk. You may need to convince your boss you are being productive. You will also need to agree how to cover any welfare issues as your boss will still have a duty of care even if you are working from home. Counterintuitively going to a really busy place might help you to focus. A noisy coffee shop can be a productive place even though on the surface it has none of the right attributes. Last time I took a transatlantic work trip I got an unbelievable amount of work done in the airport coffee shop. I shoved on my headphones and tunes and was uncharacteristically able to lock out the distractions. Using a workflow system like pomodoro timeboxing can help to manage finite amounts of concentration. Working in short 20-minute sprints reduces the period you need to concentrate for in one go. The post time box break then lets you recharge before the next repetition. ← A cure for dyslexia?